Approved RAL products are provided with a hologram as of early 2013 to make unauthorised versions difficult to produce. Imitations may show different hue and colour when observed under various light sources. In 1927 the German Reichs-Ausschuß für Lieferbedingungen und Gütesicherung (Imperial Commission for Delivery Terms and Quality Assurance) invented a collection of 40 colours under the name of "RAL 840". Prior to that date manufacturers and customers had to exchange samples to describe a tint, whereas from then on they would rely on numbers. In the 1930s the numbers were changed uniformly to four digits and the collection was renamed to "RAL 840 R" (R for revised). With tints constantly added to the collection, it was revised again in 1961 and changed to "RAL 840-HR", which consists of 210 colors and is in use to this day. In the 1960s the colours were given supplemental names to avoid confusion in case of transposed digits. 9xxx — white and black (14 gab. ), incl. metallics. In 1993 a new colour matching system was introduced, tailored to the needs of architects, designers and advertisers. It started with 1688 colours and was revised to 1625 colours. Contrary to the preceding systems RAL Design features no names and its numbering follows a scheme based on the CIELAB colour space. Each colour is represented by 7 digits, grouped in a triple and 2 pairs, representing hue, brightness and saturation. The colours of RAL Classic and RAL Design do not intersect. RAL Effect comprises 420 solid colours and, as a particular highlight, seventy metallic colours. It is the first collection from RAL to be based on waterborne paint systems. No use is made of heavy metals such as lead, cadmium and chromates. The software for architects, interior decorators and all those who deal with colours in a creative way. 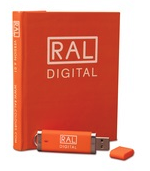 It integrates the colours of RAL Classic, RAL Effect and RAL Design into graphics and CAD programms. "Colour Feeling 09/10" is primarily designed as a professional planning tool for designers, architects, interior designers, interior decorators and painters. It is meant to be a source of inspiration on how to creatively combine the main trend colours for the coming two years. But also general consumers can be inspired by the work book to develop their own ideas and to create their personal colour design.